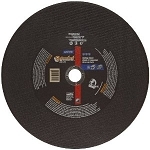 Norton 66253207554 Gemini Chop Saw Wheel 12 In. x 7/64 In. x 1 In. Norton 66253306627 Gemini Chop Saw Wheel 14 In. x 7/64 In. x 1 In.